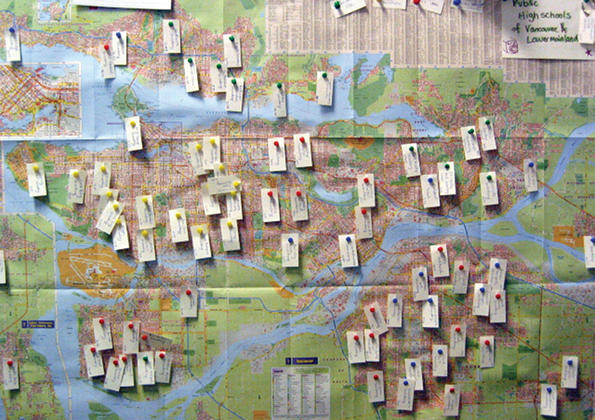 Surveillance in Vancouver high schools. Image by Richard Smith, aka Flickr user 'smith.' Uploaded 2006. Made available under a Creative Commons Attribution 2.0 Generic license. 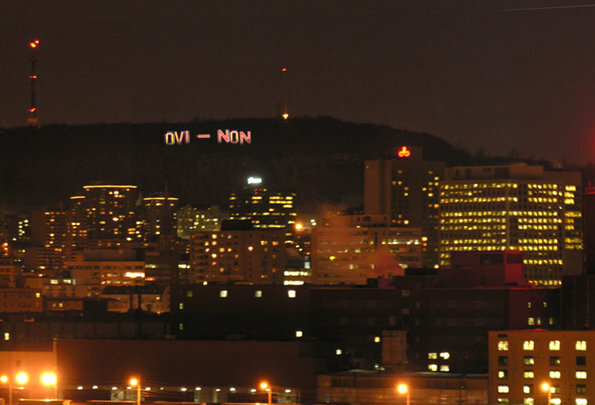 The Oui/Non Referendum Indicator (proposed installation for Mont Royal, Montréal). Shirley With Her Colour Cards by Lorna Roth. This photo was taken at the Fuji Film and Television Research Lab headquarters in Mt. Fuji, Japan, in 2004. 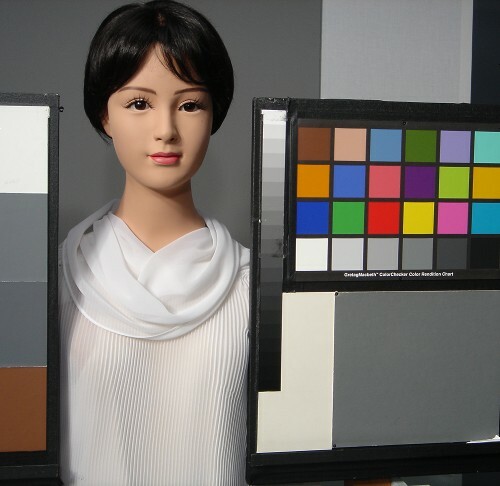 It is part of an ongoing series of colour balance imagery related to Lorna Roth’s international research on technologies, skin colour, and sociocultural cognition. Her book, Colour Balance: Race, Technologies, and “Intelligent Design” is in progress. For more information about her work visit http://artsandscience.concordia.ca/comm/faculty/roth.html. Cover image, Z_Orb, by Sabine Bitter. 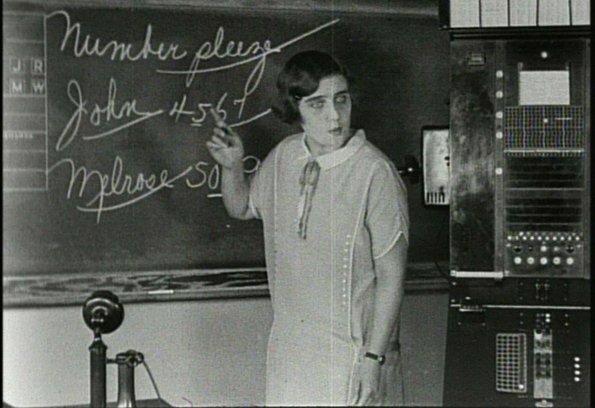 Sabine Bitter works with Helmut Weber. They have collaborated on projects addressing urban geographies, architectural representations, and related visual politics. 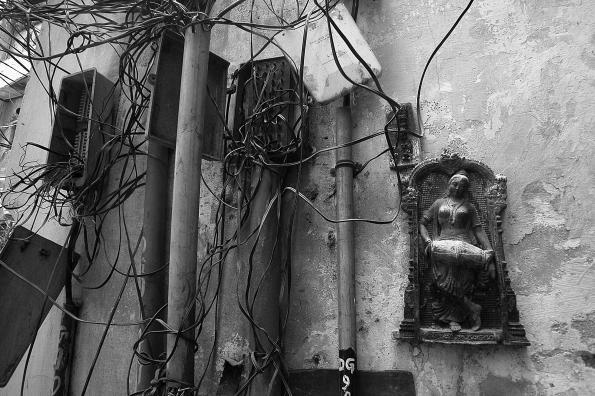 Their series of photo- and video-works such as Recent Geographies, Caracas Hecho en Venezuela and LIVE LIKE THIS! engage with specific moments and cultural logics of globalization as they are materialized in architecture as a frame for social meaning. 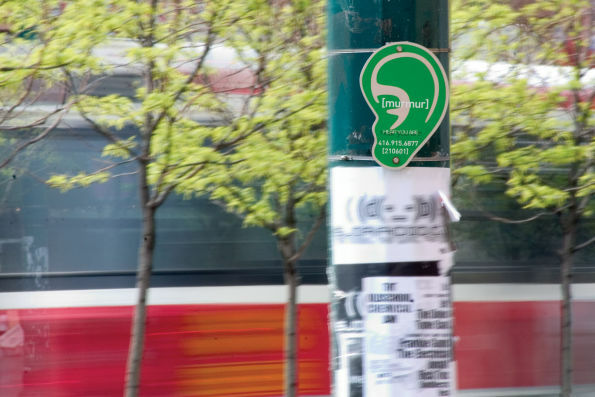 [murmur]’s Spadina Avenue installation was launched in October 2005 and funded primarily by Toronto’s “Live With Culture” program. The long abandoned Great Bear Lodge was once a popular fly-in fishing camp situated on the Leith peninsula, a little over 50 km southwest of Port Radium. It was also the site of a 5000' runway used by Eldorado Mining and Refining to receive materials from the south and to transport radium and uranium ores from the mines at Port Radium for processing at Port Hope, Ontario. It is still home to uranium contaminated soil and debris. And the fish. Robert Prenovault is a sculptor and maker of things who currently lives in Montréal, Canada. Raised in the city and having lived for many years in the bush, his work questions the supposed distinction between nature and culture. This has led him to investigate the social and symbolic meanings of landscape as a liminal space existing at the conjuncture of human endeavour and the natural environment. Electric Horizon (1997), highlights their points of contact and connection. Cindy Stelmackowich is an Ottawa-based visual artist and academic with a particular interest in medical science. 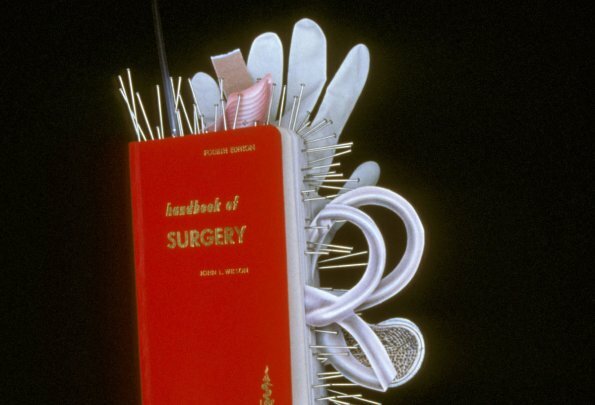 The picture on the cover, “handbook of SURGERY” (cover photo by David Barbour), is part of an ongoing series wherein medical books—textbooks, dictionaries, anatomical manuals, first aid primers—are made subject to Stelmackowich’s own incisive explorations. In these works, medical science’s bodies of knowledge become an important source of her work, not only conceptually but more directly as the material through the work is made. 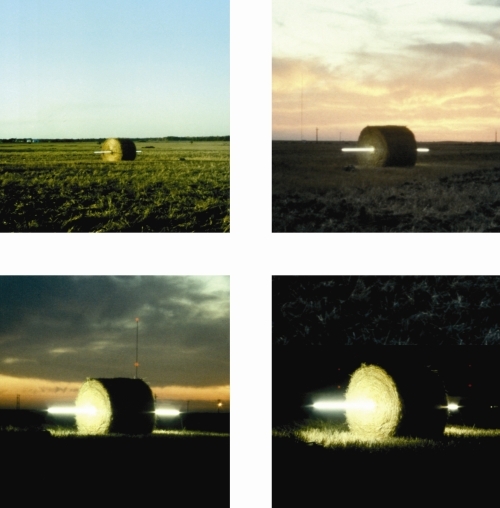 Stelmackowich has exhibited her artwork across Canada and has received numerous grants and fellowships. Currently she lectures at Carleton University where she is completing a PhD in the history and theory of anatomical illustration. For more information about her artwork visit www.patrickmikhailgallery.com. Caroline Martel is a Montreal-based documentary artist with a special interest in our relationships to technology, invisible histories, archives, cinema and telecommunications. Hold the Line (Dernier Appel, 52 min, National Film Board of Canada, 2001), was her début in professional filmmaking. The still image on the cover of this issue of the Canadian Journal of Communication is from The PHANTOM of the OPERATOR, Martel’s first feature-length production as an independent producer-director. It was shown in over 40 film events on 4 continents. For more information see www.artifactproductions.ca/phantom. 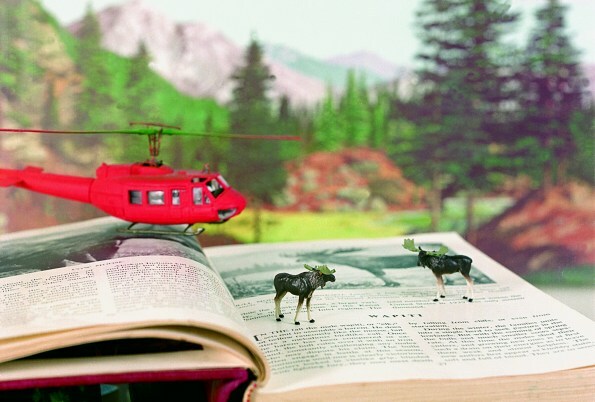 Bill Burns’ work on animals and safety, as well as on health and medicine, has been published and exhibited in Canada and internationally. The picture on the cover is from a series of large format photographs called How to Help Animals Escape fromNatural History. It is part of an ongoing series that began in 1995. 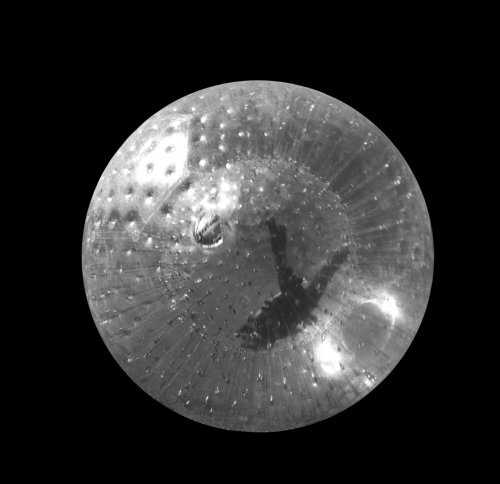 Bill is currently producing new projects for the Institute of Contemporary Arts in London and Kunst Werke ICA in Berlin. Bill’s website is at www.safetygearforsmallanimals.com. nichola feldman-kiss, a graduate of California Institute of the Arts, is a conceptual artist researching body, gaze and identity. Among her digital, analogue, and performance works is the mean body database, an extensive database of self referential surface anthropometry studies. 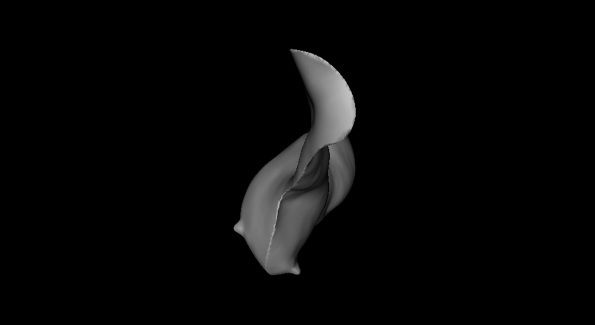 Since 2001, she has produced figurative works from the mean body database that re-imagine the body through computer aided design and manufacturing technologies. Using three-dimensional whole body scans, a digital transparency, and a light box, she has sought to achieve shapes (105x105x20cm), like the one shown here, reducing them to the most minimal bodily attributes so that, while recognizable, they have no specific referent. They recall the body without indicating it. Her fascination with the disturbing and uncanny aspects of new medical technologies for producing the human body and hybrid life forms is expressed in the chimaera set. First displayed as a part of the exhibition mean body, the chimaera set are a collection of composite figures created from two or more data sets derived from full body scans. feldman-kiss' studio is located in Ottawa, Canada. It was commissioned by the Durham Regional Labour Council (Oshawa area) with a grant from the Artist in the Workplace program of the Ontario Arts Council. The banner commemorates the Day of Mourning celebrated each April 28th. The design was developed through a series of workshops with members of Council. Carole lives and works in Toronto. 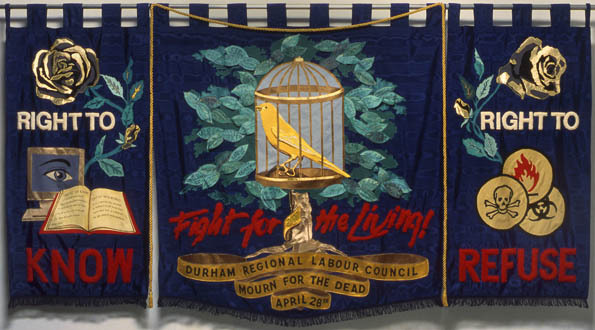 She has collaborated with various trade unions and community organizations in the production of her photographic work and fabric union banners for the past 25 years. She is active in several labour arts initiatives, including the Ontario Workers Arts and Heritage Centre in Hamilton, ON, and she was a founding member of the Mayworks Festival in Toronto. Carole is a member of CARFAC, the visual artists’ union. For more information please visit Carole’s website: www.workingimage.ca. 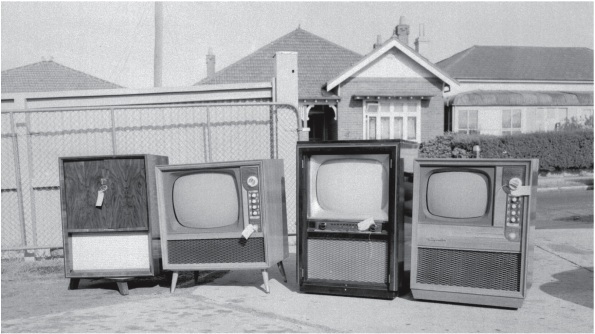 “Stolen TV Sets” from Petersham, Sydney, 1958. Image from Life After Wartime by Kate Richards and Ross Gibson. Image courtesy of the New South Wales Police Services. The Journals of Knud Rasmussen ..... Ona Spinu/Igloolik Isuma Productions Inc. This shot was taken on the set of Isuma’s new feature film The Journals of Knud Rasmussen. 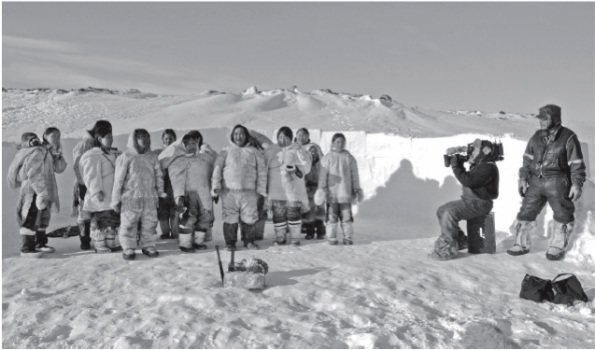 Norman Cohn and Zacharias Kunuk (far right), co-directors, prepare for the cast for a new scene. Michael Longford is an Associate Professor in the Department of Design and Computation Arts at Concordia University in Montreal. His creative work and research activities reside at the intersection of photography, graphic design, and new media. Currently, he is a co-principle investigator for the Mobile Digital Commons Network (MDCN), a joint research project launched by Concordia University and the Banff New Media Institute. He has organized numerous workshops, artist talks, exhibitions, and conferences. He is a founding member of Hexagram: Institute for Research and Creation in Media Arts and Technologies and belongs to the Advanced Digital Imaging and 3D Rapid Prototyping Group. Email: longford@alcor.concordia.ca.